Since then, she has made it her mission to instill healthy eating habits in her students so that they can escape the fate of the many patients whom she had seen suffering from diet-related disease. Over the years, Fisher and her staff have accomplished this through a commitment to scratch cooking in their kitchens, nutrition education projects like “Tomorrow’s Chefs” competitions, and online culinary training videos. 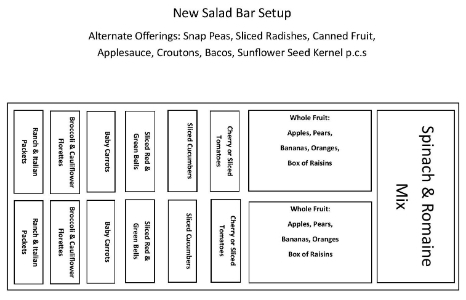 But the star of their healthy meal program has been the salad bars, which allow them to offer a variety of fresh fruits and vegetables every single day. But in practice, the staff saw that salad bar prep took less time than individually packaging produce into ½ cup portions, and that kids wasted less fruits and vegetables when they were able to take the portions they wanted—actually eating what they took. Once one site embraced the bar, Fisher would send other managers to that kitchen to witness their success, talk with the staff, and get comfortable with the idea. The domino effect of sharing what works and support within the district made salad bars a vibrant and central aspect of the meal program. Not to mention that Fisher has salad bar training and prep down to a science. 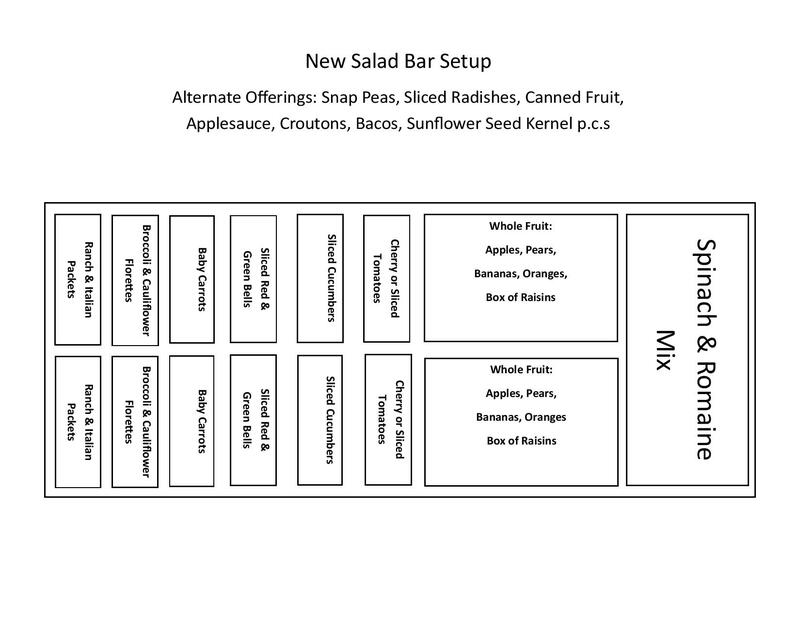 Every one of her district kitchens (there are 42 on-site kitchens and one central facility) has a “New Salad Bar Setup” diagram displayed for reference. She reports that prep time for each bar is only 15 minutes, and that she’s never had to add additional staff or increase hours to accommodate the bars, though she does count on parent volunteers to help monitor them. “For the most part we do put the salad bars after the POS, and that’s why we need supervision, because that parent monitor also checks to see if they have their half cup of fruits and vegetables required by the USDA.” One to two parent volunteers is all it takes, and they only have to be there for the actual meal service. Kids won’t put anything, including cookies, on their plate unless they know they’ll like it. Because they know that some adult in the lunchroom is going to make them eat what’s on their plate whether they like it or not. So allowing them to taste and sample something new is so helpful. Fisher has stayed true to these lessons and her students have responded—they love the salad bars. They jump on the red bell peppers, the jicama, the snap peas and the cherry tomatoes. They have grown accustomed to eating fresh produce every day and when they leave school, they continue that tradition. And that is all Fisher could ask for.